This white paper provides a blueprint for action for senior marketers and decision makers across the enterprise. It provides straightforward advice on how to build a more durable and profitable customer base by: - Building a more competitive business model. 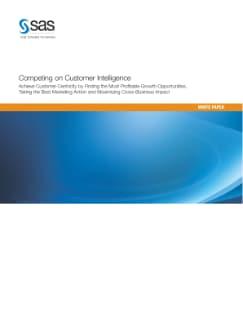 - Enabling customer-centric business strategies in a product-centric organization. - Turning expanding volumes of customer data into actionable insight for smarter decision making. - Providing a roadmap for integrating technology to achieve competitive advantage.